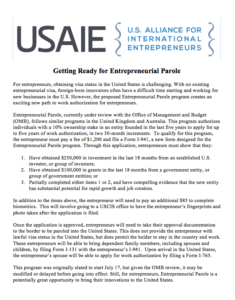 The proposed EP program creates an exciting new path to work authorization for entrepreneurs. In this PDF (click for link), we’ve written up an overview of the program according to the current details. The Entrepreneurial Parole (EP) program was originally slated to go into effect on July 17. A DHS delay in a Entrepreneurial Parole was overturned by a Federal Judge. For more information on this, please click here. AILA created the following Practice Advisory on applying applying for Entrepreneurial Parole. This entry was posted in Employment Issues, News and tagged EAD, Entrepreneurial Parole, Immigration Law, Parole, Unauthorized Employment, Wo. Bookmark the permalink.